W 83" | D 33" | H 33" | SEAT H 19.5" | SEAT D 27"
CRUSH DIVINE "CHARCOAL" (Discontinued) WITH REGENCY "SILVER GREY" WELT & BUTTONS, AND BLACK LEGS. Consistent comfort no matter which end of the seat you sit. 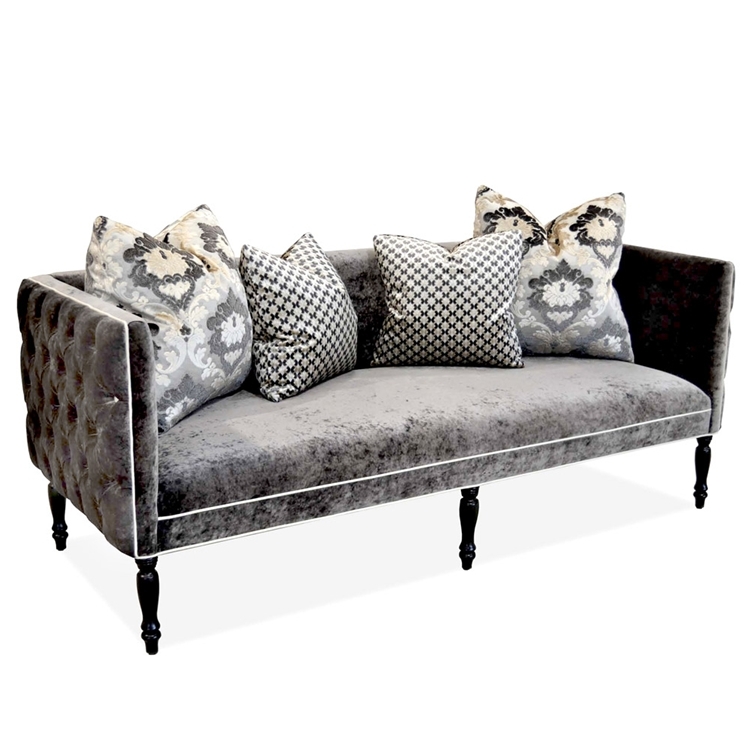 This Braxton Settee would make a great addition to your family sitting room. Not only does it look like a prop from an Old Hollywood film, but the low back would make a living room with low ceilings seem exponentially more spacious. Item is not available as shown as the fabric has been discontinued. Item is priced in a grade-c fabric. Pillows are not included. Boxed weight is approximately 198 lbs. Email info@hautehousehome.com or call 323.256.2800 for custom options.